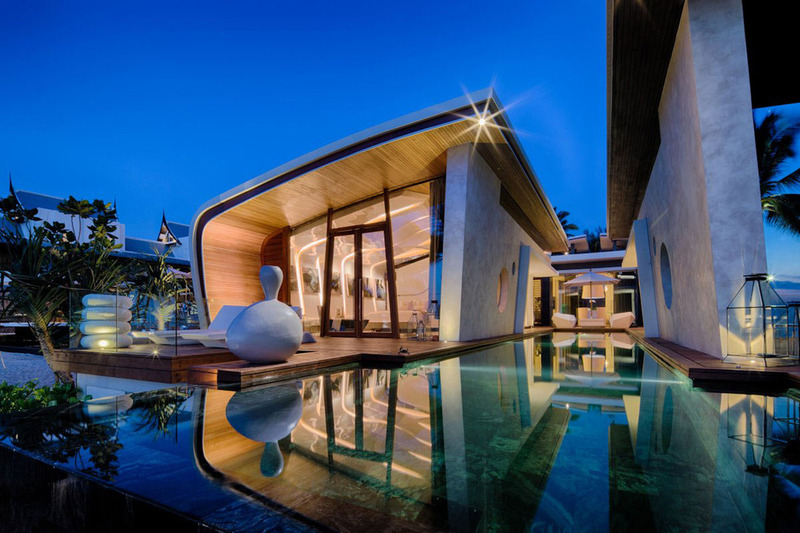 Located at the ocean’s edge near Phuket, Thailand, Iniala is a top-shelf luxury resort featuring three distinct private villas and a penthouse, as well as a number of amenities shared between all its guests. 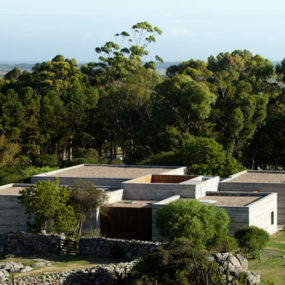 The owners of the property enlisted the help of several well-known architecture and design firms to create their masterpiece property, and Spain’s A-cero was chief among them. 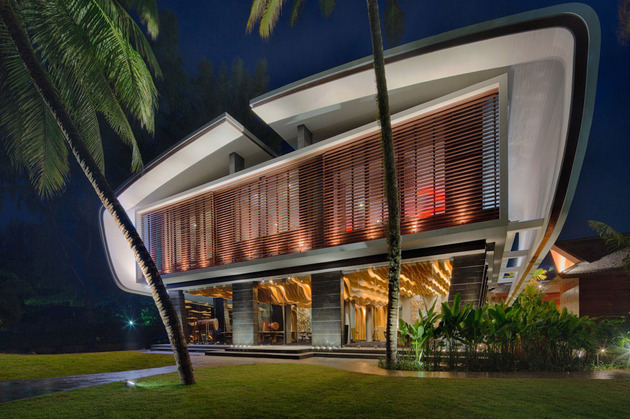 The company exercised creative control over one of the resort’s three villas, designed one room of another, and created a fantastic restaurant in the main building of the hotel. 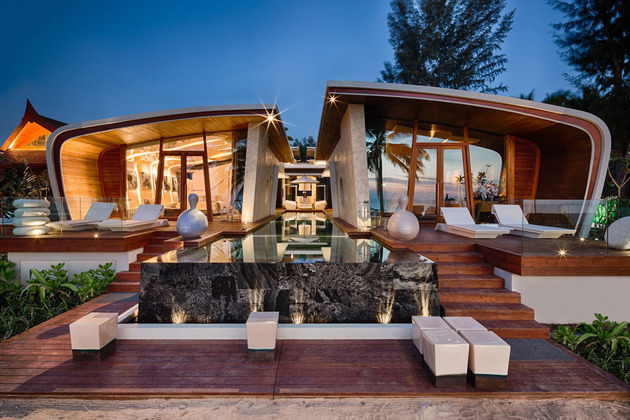 A-cero’s designs focus on connecting futuristic materials and construction techniques with the influences of nature, as well as establishing parallels with traditional Thai design and architecture. 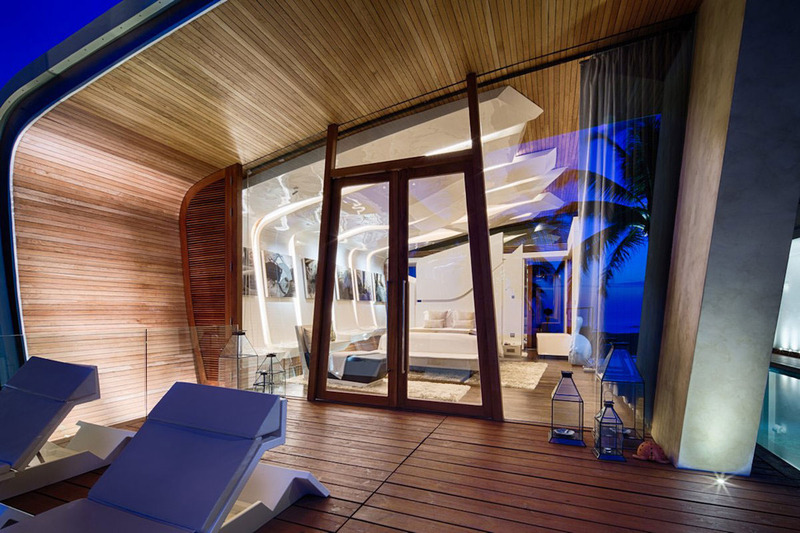 Inside the main villa, glossy white surfaces are interlaced with local wood varieties with shapes suggesting the sea’s waves. 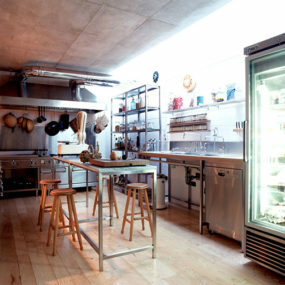 In the restaurant, warm lighting and carpeted surfaces help give a welcoming atmosphere to a compellingly modern space. The largest project in the resort overseen by A-cero is this luxurious villa, one of three different private dwellings which are part of the hotel property. 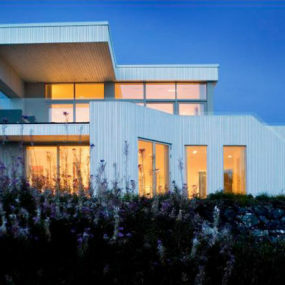 This is undoubtedly the most modern of the three, with unconventional architectural themes based on the sea’s waves and an overall design principle of flowing surfaces. 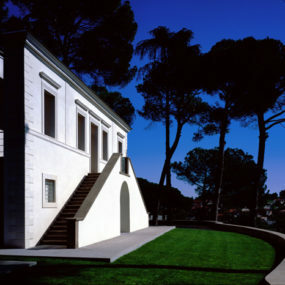 The villa contains three suites (two of which use A-cero’s designs and furnishings), a living room, and a dining room. The two beachfront bedrooms are named the “Seashell Suites” for their architecture, which wraps around two edges in a curving facade reminiscent of the smooth exterior of a shell. 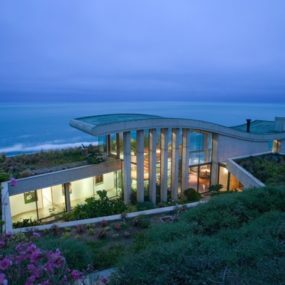 Each of these suites features a glass window wall facing the sea, protected from the view of others by the shell around the dwelling, and angular, unique French doors. 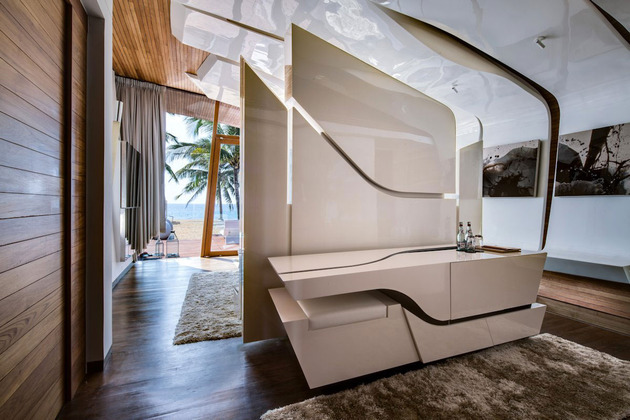 The first of the two Seashell Suites has a wavy texture pattern along one wall and its ceiling, following the curve of the exterior shell in glossy white elegance. In between those waves and along the opposite wall, a locally-sourced wood variety is framed with accent lighting to provide and organic contrast to the plastic waves. In the other Seashell Suite, the wood hues are more dominant than the gloss white sculptural elements of the room. Here, the waves are used as a means to delineate the bed area. 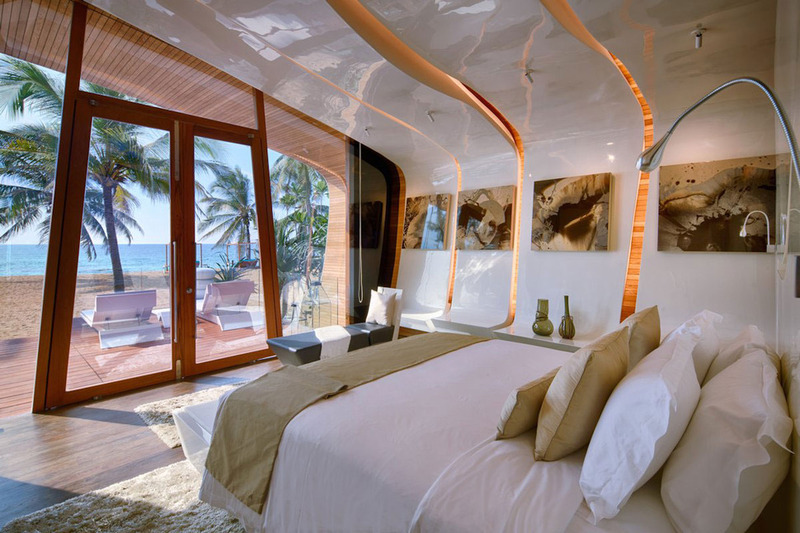 Both suites look out directly onto the beach from the bed. 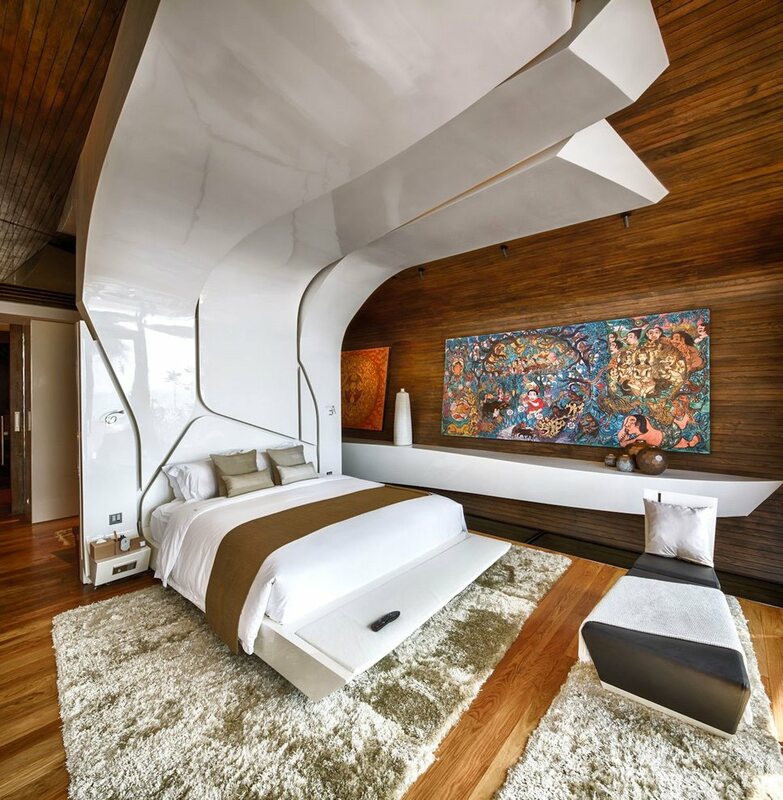 The dominant theme inside the villa is defined by utilizing ultramodern materials and shapes to create a room that feels comfortable and natural on the whole. Even though the massive built-in bed frame and gleaming white walls would not exist in nature, they seem to fit in by virtue of their sweeping shapes which invoke images of the sea. 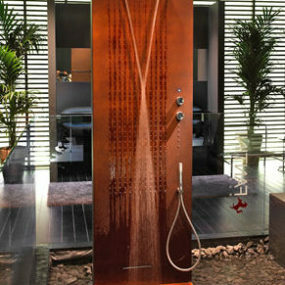 There are very few sharp corners present within A-cero’s design. 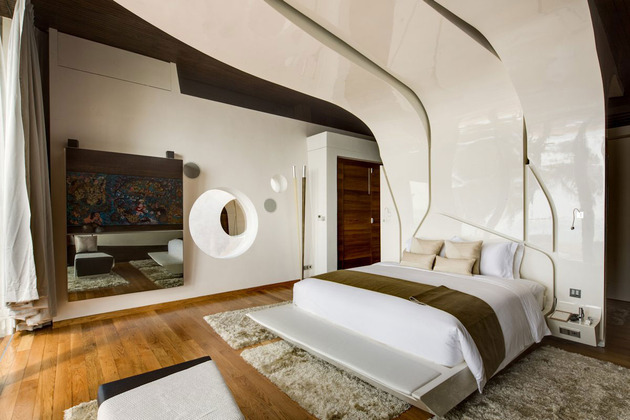 The bed’s frame in the second suite turns into a sink area for an open bathroom behind the sleeping area, one of the most undeniably futuristic portions of the villa. The other suite’s bathroom is more traditional in layout, but still employs sleek touches like a curving shower of dimmed glass. The main hotel building features amenities for larger groups of people than the compact villas alone, including a restaurant with interior design by A-cero. The upper floor of the main hotel is taken up by the resort’s penthouse, which was overseen by designer Graham Lamb. 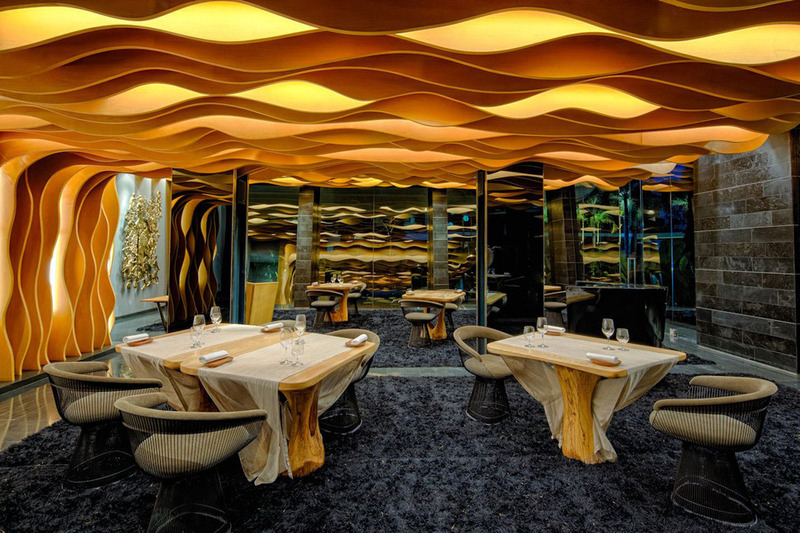 The wave motif reappears here inside the hotel property’s restaurant, but interior design was not all that the firm supplied. In addition to crafting a wonderfully intimate dining space with a modern twist, A-cero also collaborated with the hotel’s owners to bring in a renowned Spanish chef to direct its menu. The last project on the property which A-cero designed is this glass dining room, part of the resort’s “Collector’s Villa”. Cantilevered over a reflecting pool, the windows of the room can be opened to the seaside air during good weather to create an unparalleled outdoor dining space. 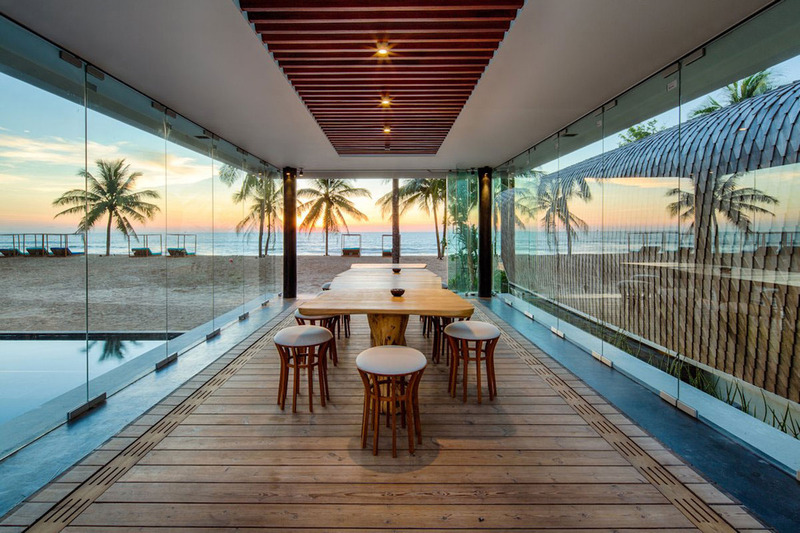 All the furnishings inside each of the firm’s projects in the resort were custom, one-off pieces, including the wooden dining table and chairs here. 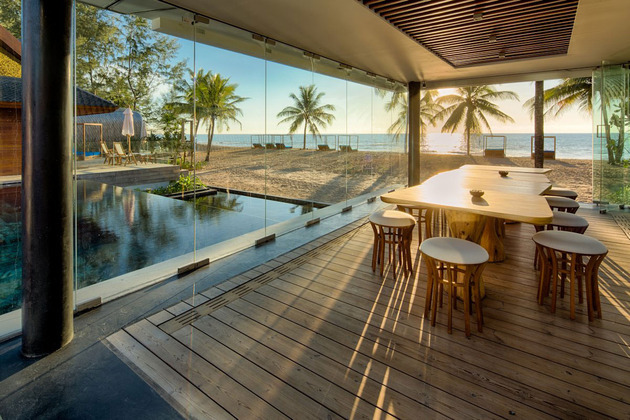 The Collector’s Villa is meant to be a modern interpretation of a traditional Thai home, so many traditional influences are seen in the design of these pieces.